What Goodyear Tires say: "Solid shoulder tread block elements offer cornering power with enhanced handling and grip. Black serrated or white letter sidewalls have sporty and contemporary styling"
TireRack: "The Eagle GT II is as sporty and affordable. Designed for performance vehicles... the all-season Eagle GT II has an aggressive tread compound tuned for high traction and tread life. Style is also a big part of the Eagle GT II with black serrated sidewall lettering. One of Goodyear's most affordable performance tires." "... at 60K miles I still have a good amount of tread left. Wear was even as I did rotate the tires regularly"
"Good traction in dry weather as well as wet." "A long-wearing and well made tire"
"I highly recommend these tires. At 160K miles these tires have had very good wear (when rotated regularly)"
"Fantastic service and support from Goodyear. In dry weather they have great traction. Would buy again." "Traction in snow and ice could be better"
"Hydroplaning can be expected in puddles"
"Not a good tire for ice or snow"
"In wet weather I had some traction problems but no more then any other All-Season tire." A very good valued tire for dry weather. If you purchase these Goodyear tires make sure you are careful in wet weather as hydroplaning appears to be more prevalent. Not a good tire if you live in snow or icy conditions. If these tires are rotated regularly (about every 12,000 miles) you should enjoy long tread life. Watch the tire pressure also on these tires. There have been reports of budging. Ask your tire dealer if they are aware of any flaws such as this. A high selling point on this tire is the attractive lettering. You can find this sporty tire font in either white or black. At the time of this review Sears Tires were asking about $125 for this tire. 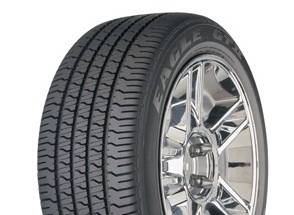 If you've owned Goodyear Eagle GT2's before, take a moment and write your own review. Non-biased reviews such as yours make this site more relevant. Also, let us know what tires you are replacing. We certainly want to know if your old tires treated you well.